Preheat the oven to 200°c (Fan 180°c), gas mark 6. Grease a 23x32cm tin and line with baking parchment. In a bowl, beat the eggs and sugar together with an electric whisk until thick and creamy. In a separate bowl, mix the flour, baking powder and cocoa powder together and sift into the egg mixture. Fold gently and then pour into the prepared tin. Spread the mixture evenly and bake for 10 minutes. Lay a separate sheet of baking parchment onto a surface and tip the ready baked cake onto the parchment, peeling off the paper. Roll the cake from the longest edge with the paper inside and leave to cool. 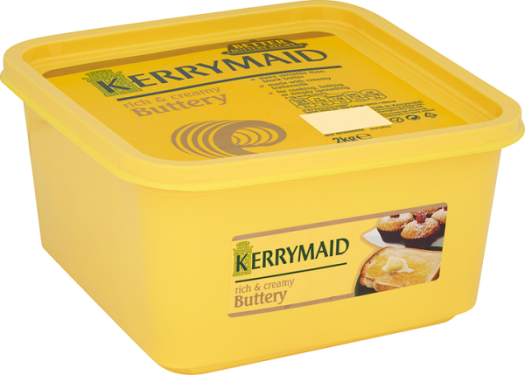 For the icing, melt the Kerrymaid Buttery and broken chocolate pieces in a bowl over a pan of simmering water. Remove from the heat and stir in the golden syrup and 5 tablespoons of Kerrymaid Double. Whisk the remaining Kerrymaid Double until it holds its shape. Unravel the cake and spread the whisked Kerrymaid Double over the top and then roll up again into a log. Spread the icing over the Yule log and mark with a fork to give a tree bark effect, slice into individual portions. When ready to serve, sprinkle some icing sugar over the portion to resemble snow and decorate with holly leaves.